Details are still not clear, but according to The Denver Post, Denver Nuggets guard Ty Lawson has been arrested and charged with physical harrasment and criminal mischief. "Lawson appeared in Arapahoe County court Monday to be arraigned on the charges, according to court documents. Lawson is free on a $1,000 bond, according to court records." "Denver Nuggets’ guard Tywon “Ty” Lawson was arrested in an alleged domestic violence incident in Arapahoe County on Saturday, according to court records. The 25-year-old Lawson was arrested by sheriff’s deputies on investigation of harassment that includes either striking, shoving or kicking as well as property damage, court records state. Both charges are misdemeanors. The incident requires a mandatory restraining order." Ty Lawson selected 18th in the 2009 NBA Draft, appeared in 73 games for the Nuggets last season, averaging 16.7 PPG, 6.9 APG & 2.7 RPG. He helped lead them to a franchise-record setting 57 - 25 (.695%) win record. 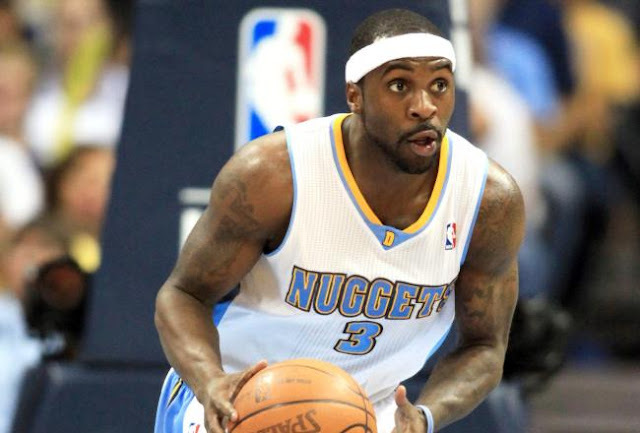 Details on Ty Lawson, Denver Nuggets PG, arrest.